Adobe has announced a series of new Creative Cloud application releases as part of IBC. We have been testing the new Adobe on the latest i9 32Gig Macbook Pro and the results are stunningly fast and impressive. We have mainly been testing Character Animator and Premiere Pro on the MacBook Pro (but also the iMac). The ProRes export, graphics functions and style transfer functions (at high res in Character) can all tax a system, yet these features run incredibly well. Adobe continues with it's AI ( Machine Learning (ML)) new tools. 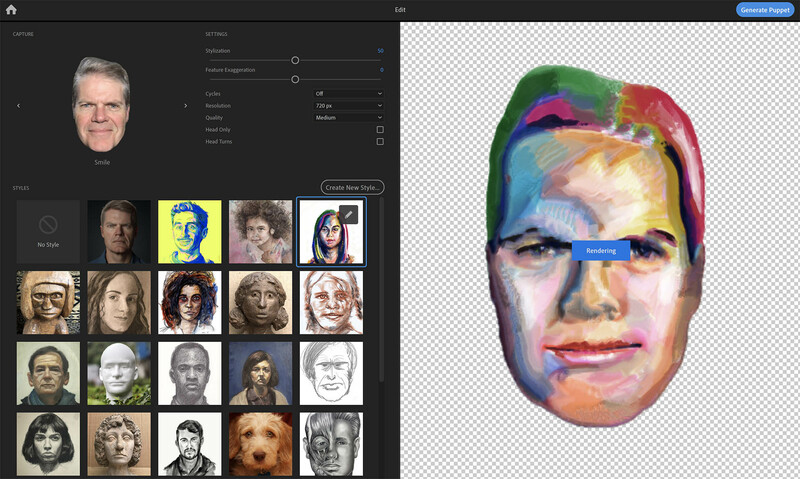 Adobe Sensei, which is the umbrella name for Adobe's ML tools, is further expanded with new Style Transfer Characterizer transforms in Adobe Character Animator. 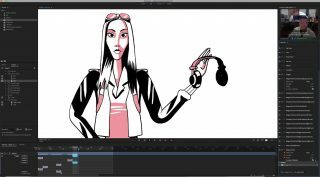 This allows any style of art to be transferred onto an animated character that you can puppet live in Adobe Character Animator CC. There are new and very useful Intelligent Audio Cleanup tools to remove noise or reverb from a recording in Premiere Pro. 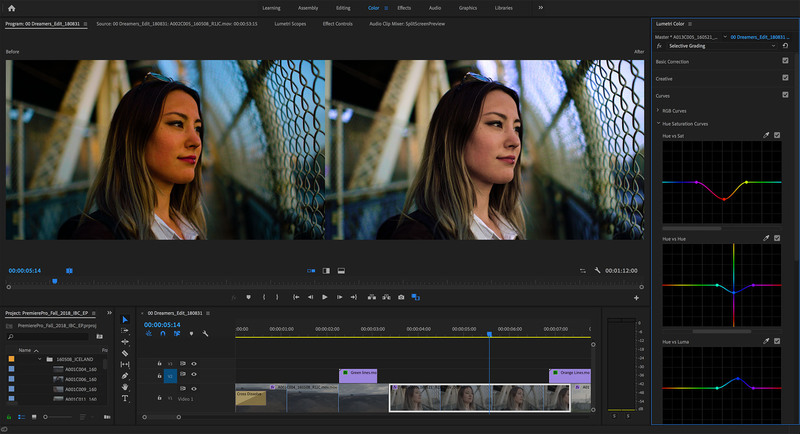 Adobe's Sensei Premiere Pro features, include Remix, Auto Ducking, Color Match, Auto Lip Sync, and Morph Cut, this is in addition to the improved visual search for Adobe Stock content. After Effects provides faster animation and compositing with more control. Advanced Puppet pins for Mesh Sculpting has been added. Advanced pins allow you to define the position, scale, and rotation of the pin giving you significant control over how the Puppet effect mesh deforms around that pin. Bend pins, for example can be used to create organic movements within a design, such as a breathing chest or a wagging tail. There is also Depth Passes now that allow one to position objects quickly and easily in 3D space. After Effects can access the depth data of native 3D elements directly within After Effects and easily composite an image layer to look as if it’s a part of a 3D scene. You can apply depth effects to make elements look natural or use depth data as part of your workflow to simulate 3D looks. Depth passes work with either the Classic 3D or the CINEMA 4D renderers inside After Effects. Native Mocha Plug-In for After Effects is now standard. You can track surfaces faster and more accurately with the new GPU-accelerated Mocha AE Plug-In for After Effects. Mocha AE is now an integrated plug-in with a simplified interface that runs natively in After Effects. 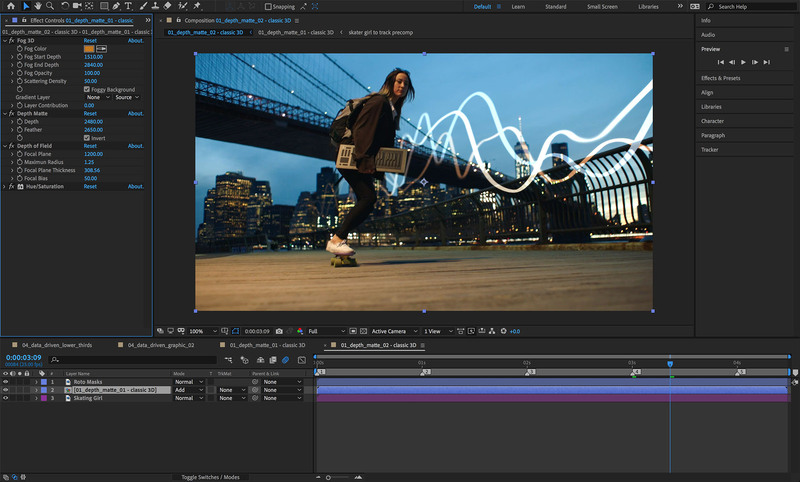 After Effects improvements allow for advanced Motion Graphics templates in After Effects as templates in Premiere Pro. These can be made by users and additional professionally-designed templates are also in the Adobe Stock library. 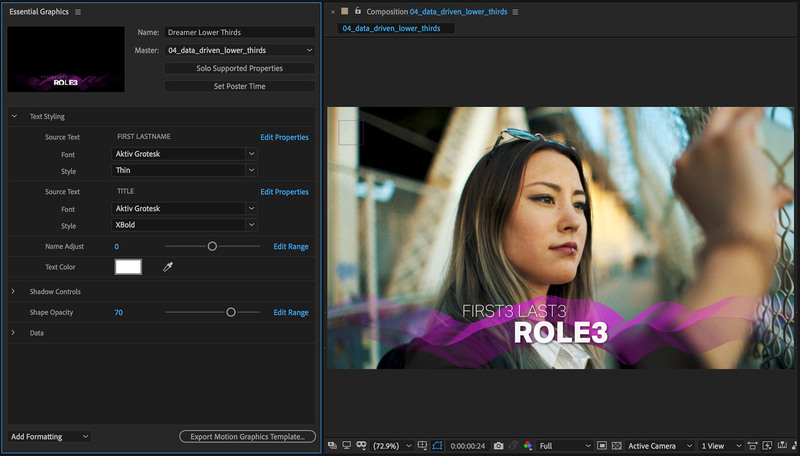 The new authoring tools in After Effects streamline production in Premiere Pro with parameter grouping to organize the templates and order the workflow for editors. One helpful feature for those not doing narrative story editing, is the new easy Data-driven Infographics which converts data/numbers into visuals in Premiere Pro. You can drag and drop spreadsheet files onto a Motion Graphics Templates to generate visual representations of your information. Any updates to the spreadsheet are then reflected automatically in the graphics. The colour tools in Premiere Pro have been made a bit simpler. It is not so much the new functionality allows things not possible before, as it now requires less panels and button presses. The new Selective Color Grading tools in Premiere Pro and After Effects remind us here at fxguide of the same tools in Autodesk Flame. Simple curve adjustments which can be selectively feathered in and out of colour ranges. This is really helpful with adjusting green screen spill, or just adjusting say skin tones. The Selective Color Grading pairs values, such as Hue vs Hue and Luma vs Saturation, on two axes that show you exactly how much you can adjust any parameter as you work. 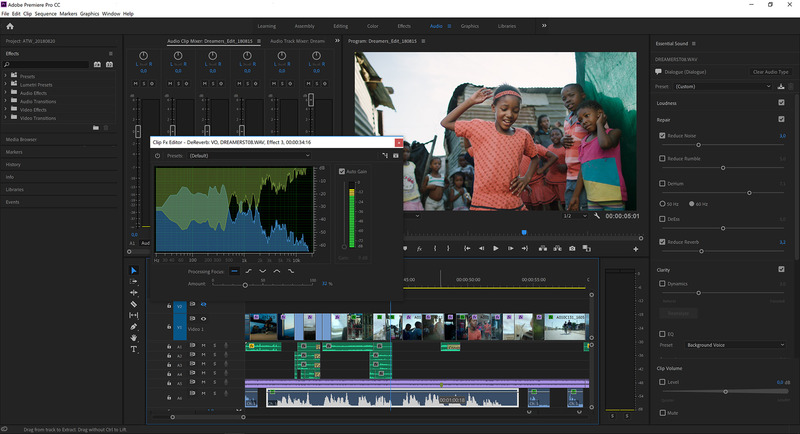 While Premiere Pro has new features, there is also the new Project Rush being shown at IBC. Rush is still in Beta, and we wrote about it here. It is an all-new mobile app that lets you create and publish professional-quality video, including color, audio, and motion graphics. A common interface and background syncing make it easy to move between mobile devices and desktop systems. A shared architecture means you can open native Project Rush projects in Premiere Pro.